Since the Gold Rush of the 19th century, Northern California has always been a land of exciting innovation and wealth. The natural beauty of the surrounding landscapes coupled with the hard working and innovative local populations has made Northern California a destination for people from all over the world looking to invent, create and produce. Today this ethic of California is best exemplified in Silicon Valley. A land of technology companies and innovation, Silicon Valley is home to some of the biggest names in the business including but not limited to Google, Facebook and Apple. The cities and towns that make up Silicon Valley offer their unique charm to this network of destinations. Milpitas is one of these places. 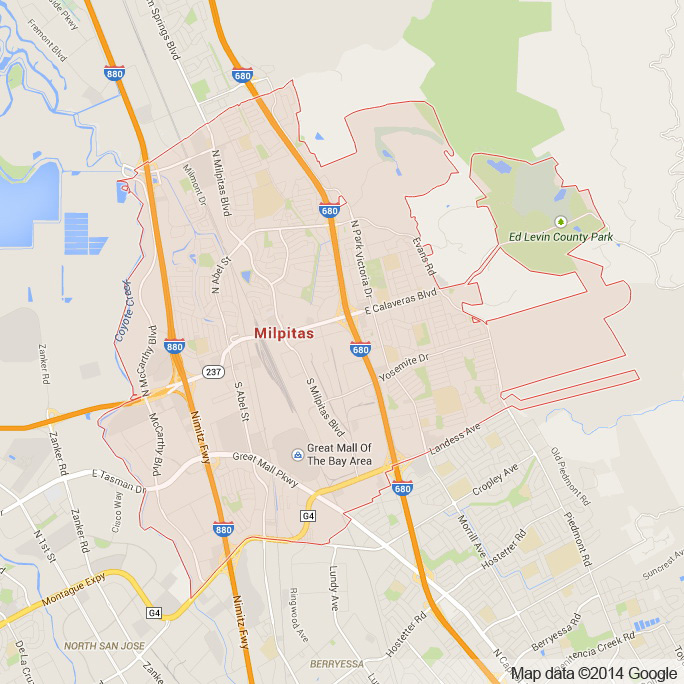 Just due North of San Jose, Milpitas is a town of 70,000 people. Historically an agricultural town with it’s name literally meaning “Place of little cornfields” is now an epicenter of the Silicon Valley technology boom. Milpitas is home to a wide range of artists and artistic events put on by the popular and well respected Milpitas Alliance for the Arts. Throughout Milpitas at it’s many parks you will find public art installations that catch the eye. Milpitas is also home to a number of fantastic restaurants for all tastes and price ranges. For those who are looking to shop the Great Mall of the Bay Area and Milpitas Square are two fantastic must see shopping centers that are some of the best in the entire Bay Area. Like other Bay Area towns Milpitas is also home to great outdoor oriented destinations like Ed R. Levin County park nestled in the foothills. Here you can see people hang gliding and paragliding on the weekends. We at Apex are excited to begin offering our full and comprehensive luxury transportation services to residents and visitors of this interesting and unique enclave in the heart of the Silicon Valley. At Apex Limousine Transportation we have a large fleet of limo vehicles that are able to accommodate parties of nearly any size. Our limousines, SUVs and sedans will compliment any wedding, bachelorette/bachelor party, junior ball, senior prom, airport pick up or drop off (OAK, SFO or SJC) or limo night out on the town with friends. We work closely with our clients to ensure that no matter what the occasion is that our services are exactly what you want and how you want them. Our ability to customize our limousine services to meet your needs make our company unique and consistently the Silicon Valley’s go to luxury transportation service. We are also excited to offer residents of Milpitas Napa Valley Wine Tours. At Apex Limousines we specialize in bringing residents of Milpitas to the beautiful Northern California Wine Country to explore and experience a multitude of restaurants and wineries unmatched around the world. This famous wine producing region is both gorgeous in it’s natural setting and delicious in it’s options for wines and foods. We guarantee that whenever you are using our limousine services you will not be disappointed. In fact there is a reason we are the most sought after luxury limo transportation company in Milpitas. Our attention to detail, the professionalism of our drivers and the luxurious conditions of each and every limousine and sedan vehicle in our fleet make us one of a kind. So please give us a call and together we can make your dreams come true one ride at a time. Please call us for car service all inclusive total for Milpitas to/from Napa Valley transfer.